7 Night Stay at the Buganvilias Resort Vacation Club in Puerto Vallarta, Mexico!! 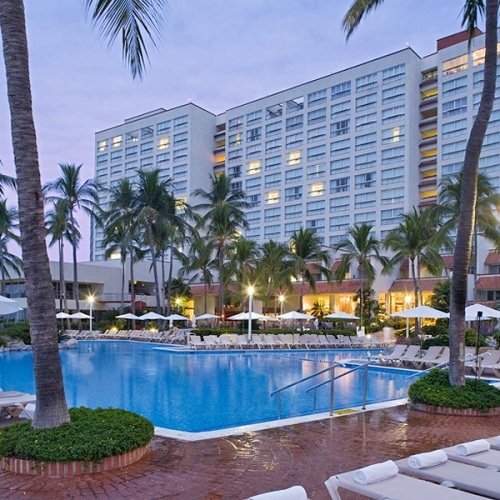 Enjoy 7 Nights at Buganvilias Resort Vacation Club in Puerto Vallarta, Mexico! The Buganvilias Resort is ideally located on the beach and just a leisurely stroll from the town of Puerto Vallarta. The garden-landscaped property includes two large, beautiful pools -- one featuring a swim-up bar and an island with waterfalls and extra-large Jacuzzi -- plus a children's pool. Enjoy superb outdoor and indoor dining at three restaurants. Take in the Mexican Fiesta dinner show for live music, entertainment, and great food, capped off by a fireworks show. There are two cocktail lounges and nightly dancing. Other amenities include a full-service spa, beauty salon, fitness center, sauna, shops, mini market, Internet/business area, and kids' club. There are recreational programs to entertain the whole family: mini-Olympics, ceramic painting lessons, piñata crafting, Spanish lessons, cocktail classes, aqua aerobics, and Salsa and Merengue dance lessons. The resort hosts tournaments for tennis, backgammon, dominoes, ping-pong, water volleyball and beach volleyball. Famous for its beaches, sport fishing, and superb dining, Puerto Vallarta offers a wonderland of vacation pleasures. The area boasts three world-class golf courses that challenge even the most seasoned players. You can enjoy back-road ATV excursions, horseback riding, parasailing, hiking, snorkeling, scuba diving, waterskiing, mountain biking, sailing, and kayaking. For those with a passion for eco-adventures, there is zip-lining over a jungle canopy, splashing in natural waterfalls, exploring impressive rock formations, dolphin and whale watching, and swimming with manta rays. Puerto Vallarta's renowned culinary offerings can be experienced along its cobblestone streets, in a bayside café at sunset, and even at the tops of magnificent cliffs. The Buganvilias Resort offers a wide choice of comfortable accommodations, all tastefully decorated in a fresh, modern style with Mexican flavor. All units feature AC, wireless high-speed Internet, cable TV, room service, mini bar, safety box, direct-dial telephone, iron and ironing board. Your Studio will accommodate 2 guests and has a partial kitchen. Your 1 Bedroom Mini Suite will accommodate 4 guests and has a partial kitchen.